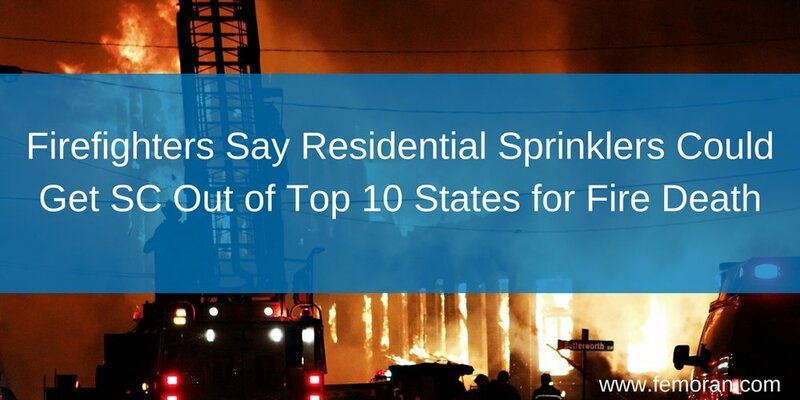 Firefighters say that fire sprinklers could help South Carolina's dire statistics. South Carolina is a leading state for fire-related deaths. A recent fire showed that fire sprinklers make a huge difference. An apartment caught fire in Beaufort, SC, when firefighters arrived four minutes after the call, the fire was extinguished and no one was injured. In fact, firefighters didn't have much to do. They mopped up some water and called it a day. "We've seen buildings that don't have sprinkler systems and buildings that do have sprinkler systems. It's quite a relief to get on a scene, see all those families evacuating, which was a good thing, and be able to go in there, and know that it's just a small, essentially a mop up operation," said Daniel Byrne with the Burton Fire District. As an example of what can happen when there aren't sprinkler systems, Byrne explained a fire he worked on at another apartment complex. "We had a major fire at the Mossy Oaks Village apartment complex a number of years ago, several families were displaced. It started as a fire in a closet and just grew out of control. There was no sprinkler system and they lost the building." South Carolina opted to not require fire sprinklers in apartment buildings. Byrne continued, "That frustrates us at the firefighter level because not only are we watching families become homeless, not only do we see the injuries and deaths, but we're putting our lives at risk going in to put out a fire that technology and codes could have eliminated before it even really got started." Newer PostSouth Korea Hospital Fire - 37+ People Killed.